Who is ready for spring break? I know I am! On Saturday, my mom and I are going to Los Angeles for the first time, and we are so excited for some much-needed relaxation and exploring (aka stalking all of the Real Housewives of Beverly Hills, the Kardashians and honestly any celebrity that comes into sight!). I always use vacations as an excuse to read something other than what has been assigned for school. I always pack a variety of fashion magazines as well as a thriller novel like one of Stephen King's to keep me entertained. A hat is a great fix when you don't want to do your hair and makeup before an early morning flight. A fun sunhat or sporty baseball cap is the perfect finishing touch to any travel look. As a college student, I usually try to save money and do my nails myself. But when you are going on a trip why not treat yourself? I recommend a gel manicure so it won't chip all week. Also, if you are breaking out the sandals over break, be sure to get a pedicure as well. Whether you are skiing in Colorado or tanning in Mexico, it is very easy for skin to dry out while traveling. I use a lotion with SPF so it doubles as sunscreen and makes my luggage a bit lighter! I am always sure to have candy on hand while on roadtrips and airplanes. It helps pass the time and can be a quick pick-me-up if you have to wait a while for your next meal due to traveling. My personal favorites are Sour Patch Watermelons, Starbursts and gummy worms. What are your travel essentials? Also, see below for my spring break style wishlist! Hi everyone! 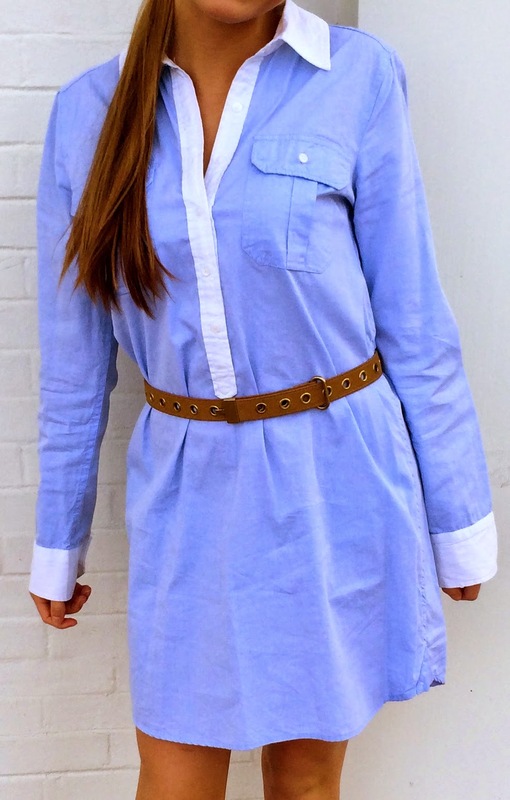 I wore one of my favorite spring trends yesterday: powder blue! Blue will always be my favorite color, but I am especially obsessed with this shade after seeing Disney's new Cinderella movie this weekend with some friends. I cannot get over the beautiful gowns that Lily James got to wear in the film! To learn more about the making of the fashions in the movie, check out this article in Vogue. Happy March everyone! Even though there is still snow in the background of these pictures, it is finally feeling a bit warmer in Illinois, with temperatures in the 50s and 60s this week! I can't wait to break out all of my favorite spring looks! I think this outfit features colors and patterns that are fun for early spring but is still warm and practical because of the cardigan and suede booties. Also, this is one of my favorite blouses from J Crew Factory that I've had for almost two years. It goes great with nearly any outfit and right now it is on sale for only $29.50! Stay tuned for my spring break wishlist this week!